I remember sending out the tweet that Bushmans Kloof hotel had been named best hotel in the world by US Travel & Leisure in 2009. I was pretty impressed. There must be some fabulous hotels around the world, I thought to myself, what would it take to be voted number one? I didn’t think I would get to find out. 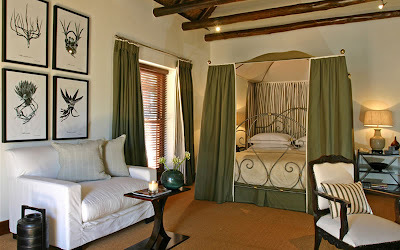 That was until I received an invitation to spend a night at Bushmans Kloof hotel. I had plans to meet the president and save the world that night, but I cancelled everything so that I could go to the Cederberg. I’m glad I did. Bushman’s Kloof is about a two hour drive away from Cape Town, at the foothills of the Cederberg mountains. Making it perfect for those wanting to get away from the hustle and bustle of the city. In fact, the cellphone reception is sketchy at best so you really do get away from it all. The area is very unique and offers an extraordinary experience. There are so many elements that together are Bushmans Kloof. Many places have a wide offering but focus on their speciality. 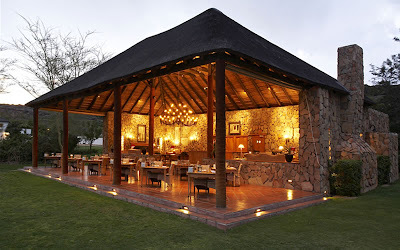 With Bushmans Kloof it’s difficult to work out what the speciality is because everything is done so well. I was impressed over and over again. I guess that’s what makes it one of the best hotels in the world. The first thing that impressed was the suite. There are only 16 rooms and suites plus the private villa called Koro Lodge, which sleeps eight. It’s certainly luxury accommodation. Not only is it very spacious and beautifully appointed, but also has all the mod cons like iPod docking station, flat screen TV and DVD player. The next thing that impressed me was the spa. Apart from the usual gamut of treatments and products, there is an outdoor spa gazebo by the river’s edge. That’s a unique experience and it can be enjoyed with a partner. Then I was blown away with food. Chef Floris Smith knows what he is doing. We had a seven course menu which showcased the new a la carte menu that had just been developed. It was amazing and very original. Here’s a sample dish: Seared Norwegian salmon layered with homemade lasagne, green asparagus, hazelnuts and a wasabi & white chocolate sauce. Sounds weird, but it was awesome. A visit to Bushmans Kloof definitely includes a culinary treat. What makes it all the more impressive is that they have a huge food garden which is quite amazing to behold. Much of the fresh fruit and veg comes from the garden. Also, let’s not forget the wine list and there is a reason they have done well in the Diners Club International Wine List of the Year Award for the last six years. 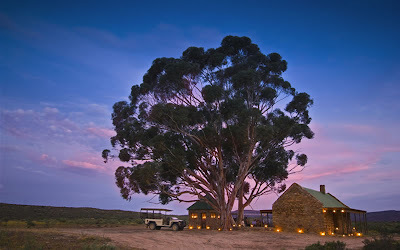 What makes Bushmans Kloof a very special place is its location. The area is very unusual, with a beauty all it’s own. There are a large number of animals and birds in the reserve. We enjoyed a sunset game drive and saw many animals. The following morning we did an early morning rock art drive to see and learn about the Bushman paintings. I was impressed with the knowledge of the guide on both drives. In fact, the staff are all very well trained. 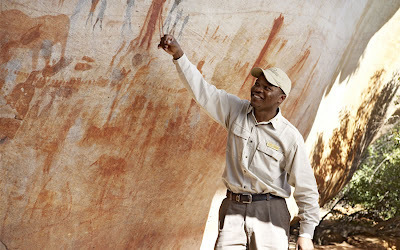 Bushmans Kloof is involved in many conservation programs and is also restoring the area after it was previously subjected to abusive farming practices. It is tempting to try and speed up the restoration process as fynbos grows slowly, but they have opted for the more natural but slow and expensive process of letting the area restore itself in a natural, balanced way. Nature lovers will enjoy the many walks and hikes that are available in the area around the resort. The Bushmans Kloof experience is a combination of all of these things and that’s what makes it one of the best hotels in the world.